BoA Women’s 100 have a new community creative project! The idea is to challenge young girls to consider who they want to be and what they can aspire to using a kit which comprises of a suffragette paper doll and three outfits to colour and cut out. 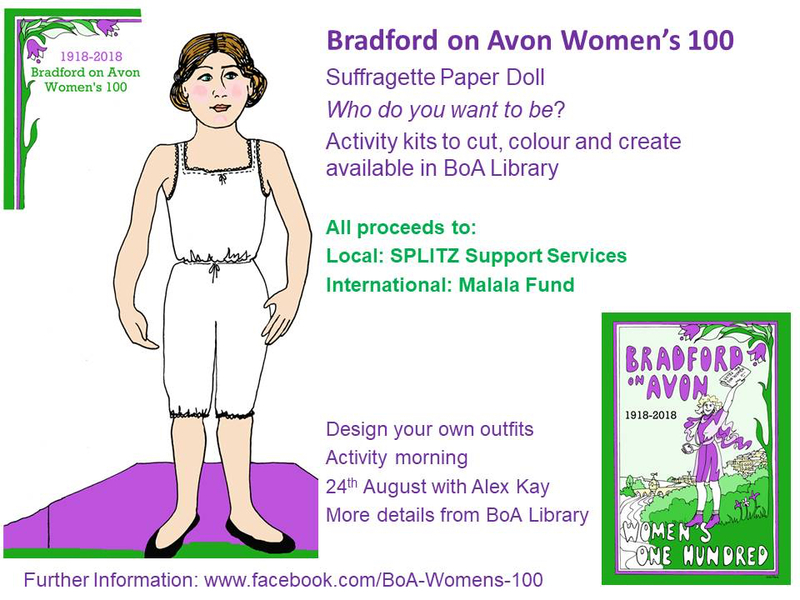 The kits are £2 and all proceeds will go to the BoA Women’s 100 charities Splitz Support Service and the Malala Fund. They are available in the Library NOW and will be all summer hols. In parallel, Bradford on Avon Library is compiling a book list for W’s 100: both junior and adult. On the morning of 24th August, Mayor Alex Kay, who is also an artist/illustrator, will run a workshop in the Library helping children to design their own outfits.